Time was when Dodge’s Dakota was being marketed as almost a compact pickup truck. It was bigger than trucks like the Toyota Tacoma or Mazda B series, but not as big as the full sized trucks like the Dodge Ram, Ford F150 and the like. Then it must have reached puberty or something, because it experienced a growth spurt that, while it didn’t shoot out to the size of those full sized trucks mentioned above, at least saw it growing farther away from those still compact trucks. It also “matured” aesthetically so that it now sports the look of the big Ram pickups, with a macho nose that looks as if it could double as a battering Ram in a pinch and a boxy exterior that’s all truck. It looks like it’s been working out with weights and now sports chiseled pecs, biceps and hips. I liked the look of the older Dakota better, but DaimlerChrysler never asked me – and I’m not a truck guy anyway, so it’s probably just as well. 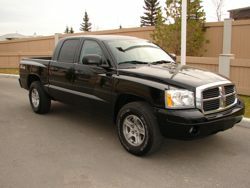 But the new version is definitely identifiable as a Dodge, looking somewhat like a smaller scale version of the big Ram. 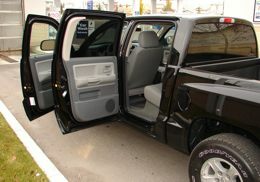 My tester was a black SLT Quad Cab 4x4 that tipped the retail scale at $37,445 Canadian, a not unreasonable price in today’s marketplace. For those dollars you get V8 power, plenty of standard equipment, and some nice options that make it perform better and be more pleasant to be inside. All in all, this is a pretty straightforward truck. Outside it’s all work including, at least in my tester, a bed liner to help protect the truck from getting all scratched up when you’re hauling stuff. We took advantage of that to haul stuff ranging from a deep freeze and a table to an IKEA book shelf, and the Dakota did a fine job, though its short bed meant we had to lean the tall book case onto the tailgate to get it home. Not a big deal, and a common situation with shorter beds. The Dakota is offered with three engine choices, from the standard 3.7-litre Magnum V6 rated at 210 horsepower and 235 pound-feet of torque to a pair of 4.7-litre Magnum V8s, one of which puts 230 horsepower and 290 pound-feet of torque onto the road while the other, high output, version cranks out 260 horsepower and 310 pound-feet of torque. My tester had the top-line engine coupled to a 5-speed automatic transmission that seemed to hunt and peck a tad but not seriously so. The truck has plenty of poop, though it’s no Hemi. No Hemi option is available for the Dakota. And to be fair, it probably isn’t needed; I had no problem reaching excessive speed levels in the Dakota and though I didn’t haul anything particularly heavy it performed very well with the various loads I did stuff into its bed. 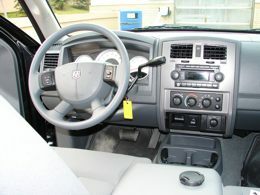 Inside, the truck is quite comfortable, within reason, and nicely designed ergonomically. While it's also a tad bland, and maybe even a bit drab with its grey plastic (which I suppose could also be considered "elegantly uncluttered"), everything is laid out well and works fine. The front seat is comfortable for short hauls, but we took it on a trip that was three hours one way and it left a lot to be desired. My tester came with a cloth, 40/20/40 split bench that almost feels like buckets thanks to the centre armrest storage thingy. But by the time we reached our destination (after the three hours of non-stop driving), we were starting to feel like dead end kids. No butts about it! The return trip was accomplished at a more leisurely pace, in that we stopped once at about the half way point, and that short rest made all the difference. Maybe it's just the shape of our bums, or lack of them being in shape, but I wouldn't want this to be my primary travel vehicle for that reason alone. On the other hand, for shorter hauls and for hauling stuff, the seats were fine. The rear-seat is pretty comfortable and supposedly seats three. 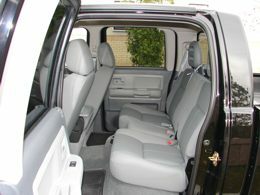 There's plenty of room in the back of the quad cab, for either people or stuff. The seat bottom splits and folds up to reveal a flat floor suitable for hauling stuff you don't want in the bed. Not surprisingly, the Dakota drives like a truck. A sports car it ain't, and though the chassis does seem to float a tad the truck actually feels quite nimble for a workhorse and, all things considered, handles quite well. The suspension is independent up front, with a live axle rear. My 4x4 came with an electronic Shift-on-the-Fly part-time transfer case. I never took the Dakota off road, but imagine it'll eat up the roadless areas well. Steering is power assisted rack and pinion; brakes are discs up front and drums in the rear. Comfort/convenience amenities include keyless entry, air conditioning, a pretty good AM/FM CD changer stereo, power locks, mirrors and windows and a "luxury steering wheel" that, oddly enough, feels pretty much like a steering wheel. The SLT also comes with P245/70R16 on/off road tires, which help contribute to its truck-like handling (well, duh!). Mine had optional P265/70R16's. You get a full size spare tire, fog lamps and variable intermittent windshield wipers. My tester also came with a security system, trailer tow group and a defroster for the non-opening rear window. The Dodge Dakota SLT Quad Cab 4x4 starts at $26,740 US.